"All the facilities at City, from library resources, to teaching staff and their willingness to help and guide you along your way, have been amazing." It was quite a coincidence for me to apply for Radiography- Radiotherapy and Oncology to be honest. My mother is a consultant radiologist at Lincoln County Hospital and since I hadn’t gone into further study after completing my previous Bachelor’s degree in Archaeology, she suggested I try Radiography. At the time of me applying, all the diagnostic places were taken and therefore I applied for the radiotherapy pathway not really knowing what it was about but once I started, I knew I found something that would fulfil me for the rest of my career. For me it was about the location really, so I ended up applying to several universities in and around London. When it came to deciding which one to choose from the offers I had, I found out that City had a very good programme for radiotherapy and most of the radiographers I had spoken to about my future university choices were actually alumni of City and couldn’t recommend it more to me. What has been the highlight of your time at City? What have you most enjoyed learning about? I really enjoy the practical side of my course. We have various rotations in radiotherapy departments in different hospitals in and around London and it is always interesting to meet the different teams of radiographers and other hospital staff working there, as well as getting to know the patients that you treat along the way during your studies. All the facilities at City, from library resources, VERT teaching rooms, to teaching staff and their willingness to help and guide you along your way, have been amazing. I have a part-time job outside of University working at a pub in London Bridge, so that takes up most of my time outside of my course. I also own a horse which I keep in Kent, so that is where I usually am when I have spare time. I’m also part of the committee for the City University Mountaineering Club and have been a part of the club since the beginning of my studies at City. Could you tell us about your placements; where have you been based? What have you enjoyed most? What support you’ve received whilst on placement. What you might get involved in on a typical day. I have so far been at two different hospitals; University College London Hospital (UCLH) and The Royal Free Hospital with UCLH being my usual base hospital. Both of these have been amazing and it has been very helpful and interesting getting to work in two relatively different work environments. 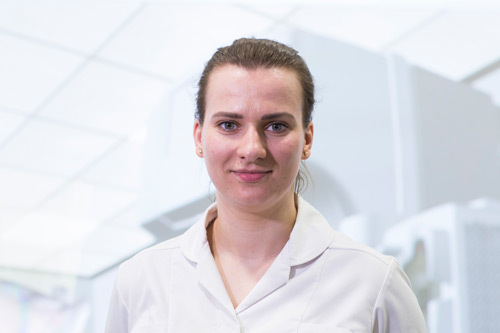 As a student, I take part in the day to day running of the radiotherapy department, dealing with patients, answering any questions or concerns that they may have about their treatment, as well as actually participating and carrying out the treatment of patients. I enjoy spending time with my Mountaineering Club friends and doing all sorts of activities together. It’s a shame that I only have one more year left at City but at the same time I am looking forward to being a qualified radiographer and working in radiotherapy full-time. The placements are absolutely crucial in understanding what is required of us as qualified radiographers and in applying the theory learnt at University to actual practice. It is really only these that properly prepare us for our future careers. If you enjoy being around people and want a sense of fulfilment from what you will be doing on a daily basis, then just go for it and put your all into the course and it will all pay off! Have no doubts. Well I think that is pretty much self- explanatory at this point but I plan on working in radiotherapy and hopefully making my way up to a more senior position soon.